To all of Tosoh’s valued shareholders, business partners, employees, and various stakeholders, it is my pleasure to present you with Tosoh’s corporate annual report for fiscal 2016. During the fiscal year under review, I succeeded Kenichi Udagawa as the company’s president. 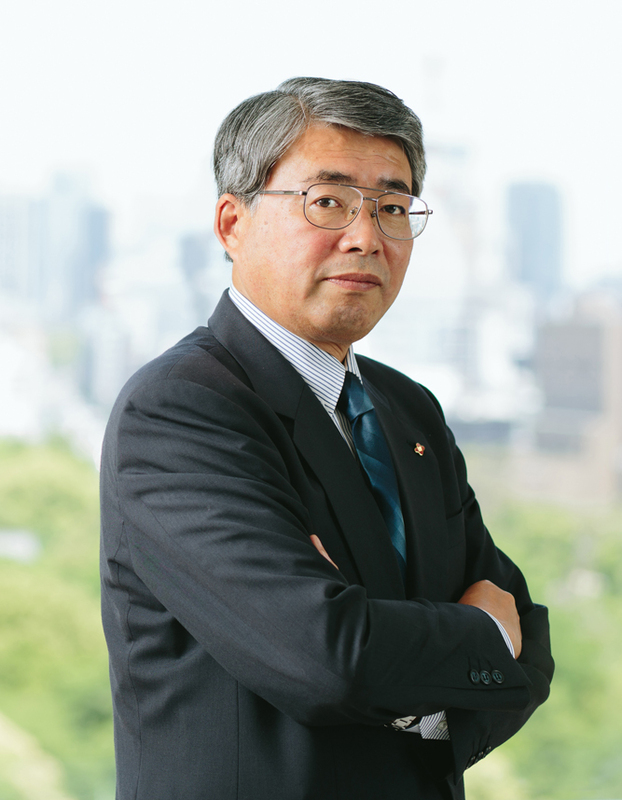 We are grateful for Mr. Udagawa’s six years as president and his many years of experience and counsel will be invaluable as he serves as Tosoh’s corporate adviser. In my new position as president, I will strive to take Tosoh to greater heights than ever before by making the company stronger than it has ever been. In pursuit of this, I kindly ask for your support in continuing to move the company forward guided by the foundations, knowledge, and vision of my predecessors, contemporaries, and of new generations. Since its beginnings, Tosoh Corporation and the Tosoh Group have sought technology through chemistry. We strive collectively to be a unique chemical company that is rich in more than merely a financial sense. We are, for instance, growing in so many ways amid the expanding role of chemistry in dealing with environmental- and energy-related societal challenges. The urgent need to face these realities compels us to strengthen our business foundation and utilize innovations in chemistry to contribute to better societies and more fulfilling lifestyles. Tosoh’s rapid responses to its ever-evolving operating environment continually increase its corporate value, as does it emphasis on fair and transparent management practices. Specifically to establish a business structure that is increasingly resistant to external factors, we are strengthening our commodities and expanding our specialties operations. Our objective is nothing short of formidable competitiveness globally, so our efforts regarding our commodities and specialties are laying the groundwork essential to growing our presence worldwide. We are, in that vein, forging ahead with our recently released medium-term business plan released recently. And we are of course cultivating a corporate culture of safety by continuing to act on the safety reforms that we put into place early in August 2012. Although we experienced mixed results in fiscal 2016, I can say that Tosoh is on stable ground and posted record profits despite lower sales. The company moved ahead with core strategies to further its profitability and to position itself and its group for growth in a rapidly changing business environment. In fiscal 2016, profit rose to record levels despite a decline in sales. Lower crude oil and naphtha prices caused petrochemical product prices to fall, in Japan and overseas. Consolidated net sales fell 6.9% from a year earlier, to ¥753.7 billion (US$6.7 billion). Operating income, however, rose 35.1%, to a record ¥69.4 billion (US$616.3 million). Ordinary income climbed 9.3%, to ¥65.8 billion (US$584.1 million). The increase in operating income was due mainly to lower prices of raw materials and fuel and to an increase in volumes sold. Improvements in operating and ordinary income notwithstanding, profit attributable to the owners of the parent company declined 36.3%, to ¥39.7 billion (US$352.1 million). This was largely the result of deferred tax assets posted during fiscal 2015 in relation to Tosoh’s merger with Nippon Polyurethane Industry Co., Ltd.
Commodities and specialties operations contributed to the growth in operating income. Among our commodities operations, the operating income of the Chlor-alkali Group jumped despite a decrease in group net sales. The Chlor-alkali Group was, in fact, the major contributor to Tosoh’s consolidated net sales among Tosoh’s operating groups. Although vinyl chloride resin sales volume grew because of expanded vinyl chloride monomer (VCM) production capacity, the margin of growth was not enough to offset the decline in petrochemical product prices. The Petrochemical Group, therefore, experienced a drop in sales, but it did achieve a substantial increase in profits. Our Specialty Group maintained net sales in fiscal 2016 equal to those in fiscal 2015. This group, however, upped its contribution to our operating income, generating 47.1% of Tosoh’s consolidated operating income. In the first half of fiscal 2016, Japan’s economy experienced sluggish exports and production as a result of slowdowns in China and some developing nations. Corporate revenues in Japan nevertheless continued to recover. And Japan’s economy entered a gentle upswing amid a steady recovery in hiring and in household incomes and a resulting brisk uptick in personal consumption. Unexpectedly, toward the end of the first half we were forced to revise downward our forecast for full-year net sales because of declines in domestic and overseas product prices caused by falling prices for crude oil, naphtha, and other raw materials. Overall, though, the Japanese economy recovered somewhat in our fiscal 2016 on account of the economic and fiscal policies of the Japanese government and the Bank of Japan. As we entered calendar 2016, however, there was downward pressure on the global economy, such that stock prices weakened and the yen strengthened. The resulting lack of confidence in business conditions amid increasingly negative consumer sentiment slowed Japan’s recovery. The Chlor-alkali Group’s net sales decreased, but its operating income increased on the back of increased sales volume. Shipments of caustic soda rose on the higher production volume ensuing from an increase in the operating rate of electrolysis equipment. Domestic caustic soda product prices declined slightly, while export prices improved owing to the weak yen. Shipments of VCM and polyvinyl chloride (PVC) rose, given a boost in VCM production capacity in fall 2014. But VCM and PVC product prices fell, largely because of a decline in the price of naphtha. In September, Tosoh increased its stake in Mabuhay Vinyl Corporation (Mabuhay) to 87.97% from 39.92% and made the Philippines-based chlor-alkali manufacturer a subsidiary. Chlor-alkali sales are expected to see stable growth in the Philippines, and Tosoh views this overseas operation as vital to its vinyl isocyanate chain. Tosoh will gradually integrate the new subsidiary’s management system with its own. In the meantime, shipments of urethane raw materials were down because of a slowdown in China’s economy and softening overseas markets. Petrochemical Group net sales declined, but as with other commodities groups the Petrochemical Group’s operating income rose thanks to increased sales volume. The decline in net sales was chiefly because petrochemical product prices fell in Japan and abroad in association with lower crude oil and naphtha prices worldwide. We’ve established a flexible naphtha cracker production and sales system that adapts to the business environment. And in the year under review, we maintained a high, 95% cracker operating rate to leverage high-volume ethylene purchases. We also set a price structure whose spreads on raw material costs helped expand the Petrochemical Group’s profit margins. In addition, we strategically continued to heighten the added-value of polyethylene (PE) products by increasing our sales of functional and special PE for the pharmaceutical and food packaging industries. Specialty Group shipments of ethyleneamines decreased as competitors expanded production capacity, exacerbating an imbalance between supply and demand. Ethyleneamine product prices increased abroad because of the weak yen. Shipments rose of such separation-related products as liquid chromatography packing materials. Similarly, shipments increased of diagnostic-related product in-vitro diagnostic reagents. Shipments of high-silica zeolites (HSZ®) likewise increased, thanks to a boost in production capacity in fall 2014. Shipments of zirconia for dental applications also rose. Net sales and operating income for the Engineering Group increased. Domestic sales of water treatment facilities, services, and related chemicals were up. This reflected growth in plant construction and in requests for maintenance and renovation overall in the water treatment industry, primarily for the electronics sector. Overseas sales rose largely as a result of increased demand from a rising number of electronics plants. In fiscal 2015, we reorganized our research and development (R&D) activities out of an awareness that we must plant the seeds for growth now. We have high hopes that this reorganization will achieve strong results. Our R&D structure centers on technical field and function, which grants us the opportunity to realign our resources in accordance with Tosoh Group priorities. Tosoh’s seven research laboratories operate in line with three long-term themes focused on life science, functional polymers, and advanced materials. Their activities aim to enlarge our business by pursuing such promising new areas as batteries and printed electronics. Japan’s economic recovery is expected to steadily gain momentum in fiscal 2017 as personal income and the employment situation improve further. Note, though, that business downturns in China and other Asian nations and in countries that provide raw materials make it increasingly difficult to be certain about trends in the global economy and financial markets. The Tosoh Group is making every effort to increase its profitability. It is expanding its sales volume, maintaining an optimum pricing structure, reducing costs, and boosting earning power throughout its operations, among other things. For fiscal 2017, Tosoh predicts net sales of ¥720 billion, operating income of ¥72 billion, ordinary income of ¥72 billion, and profit attributable to the owners of the parent company of ¥47 billion. These forecasts are based on a domestic standard price for naphtha of ¥40,000 per kiloliter and on an exchange rate of ¥110 to the US dollar. We plan to increase capital expenditures to ¥36 billion from ¥27.9 billion in fiscal 2016 and to raise R&D expenses from ¥13.7 billion in fiscal 2016 to to ¥15 billion. We aim to reduce interest-bearing liabilities by ¥24.6 billion, to ¥175 billion from ¥199.6 billion, further increasing our equity ratio to over 50% from fiscal 2016’s 46.3%. And we intend to increase our total dividends to ¥15 yen per share from ¥14 and to see our earnings per share advance from ¥62.61 to ¥72.43. In addition, we anticipate our workforce growing from 12,037 to 12,300 persons. We expect to increase production capacity in enzyme immunoassay reagents and zirconia powder. And we plan to complete a new plant for high-silica zeolite (HSZ) in Malaysia and to replace a boiler for electric power generation at the Nanyo Complex. Key areas of concern remain the slowdown in China’s economy; the recovery in the eurozone; the prices of raw materials, particularly of oil and naphtha; and the exchange rates, as the yen has rebounded in recent months. We nevertheless aim to continue our safety reforms, to improve the profitability of our commodities business, to optimize our value chain, and to expand our specialty chemicals business. Tosoh’s corporate governance code calls for three-year, medium-term business plans. Our most recent plan will guide us through fiscal 2019 and features realistic and attainable goals related to building a strong company that consistently generates value for its customers, investors, and stakeholders based on a dual commodities and specialties approach to business. This report subsequently presents highlights of our medium-term plan and the strategies that we are pursuing in our commodities and specialties operations to stabilize profitability in the years ahead. For that in-depth summary, we refer readers to the following "Strategy" feature of Tosoh Annual Report 2016. Tosoh is committed to being a good corporate citizen. Around the world, it complies with regulations and guidelines, works to achieve safe operations, ensures employee health and welfare, and contributes to local communities through corporate social activities. For fiscal 2016, we plan for the first time to issue a corporate social responsibility report. That report builds on the Responsible Care (RC) reports that we’ve prepared since 1997. It is unfortunate that we will have to show in that inaugural report that we were unable in the year under review to fulfill our targets for safe and continuous plant operation. Improving our record in these areas will go a long way to helping us expand our business and increase its profitability. Tosoh’s corporate governance system, meanwhile, ensures transparency, compliance, and operational efficiency. We believe in the system’s ability to enhance corporate value and growth. We will continue, meanwhile, setting up programs to improve the safety of our domestic production operations. That means a hands-on approach at our major production facilities in Japan, including speaking with the managers and employees of those facilities about the progress and effectiveness of our safety programs. We value our people and have programs in place to oversee their health and welfare, job satisfaction and productivity, and personal growth. Our employee programs instill an awareness of such important issues as environmental concerns and social contributions. As we move further into fiscal 2017, a number of principal issues confront the company. Foremost among them is the safety of our workers and customers—a perennial focus for Tosoh. We all remember vividly the 2011 VCM plant explosion and must never forget what happened. To prevent a recurrence of this tragedy, we have invested ¥10 billion in plant safety over the past three years. Efforts in regard to safety will never be complete, but we have achieved a measure of plant and equipment safety preparedness and are seeing tangible results. We are also concentrating on “soft elements” to ensure that our employees are trained in and aware of safety measures and safety-related technology. This is helping to create a work environment that is better for everyone, and we are confident that we can count on the cooperation and support of all in furthering the safety of our operations. Our record profit in fiscal 2016 was thanks to the unstinting efforts of our employees, reduced petroleum costs, and a lower yen. In recent months, however, oil prices and the yen have been rebounding, so we must prepare ourselves for less-favorable business conditions. We must further boost our profitability to ensure the continued success and prosperity of our company. To that end, it is imperative that we sow the seeds of growth now. Our commodity products are basic materials with long life cycles. And we are working at high rates of capacity utilization to manufacture most of them. Apart from recent developments in petroleum and product prices, we know that the expansion of production capacity and the construction of production facilities are vital to our future. We must continue to ensure the price competitiveness of our products and to enhance their value-added. We must also seek feedback from our customers regarding particularly our made-to-order products. We think that market participants understand our products. But we need to do more in this area. We won’t, however, be able to if our products lag the performance of their rivals. To bring to market new products with higher value-added, we must have a speedy and accurate grasp of changing market needs. Our R&D efforts must bear fruit in marketable products. We are expecting strong results from our reorganized R&D activities. In all of our endeavors, we look forward to your continued and much appreciated support in fiscal 2017. My aspiration is for Tosoh to be a crystallization of its employees’ skills and knowledge, a company that we can be proud of and confident in, a company that fosters the next generation of leaders.